These domain names have already met their reserves for next week’s live domain name auction. Next week is NamesCon, and that means that next week we have a live domain name auction put on by Right of the Dot with help from NameJet. Bidding is currently open. While bidding is fast and furious on top domains, these domains are also well below their reserves. You can’t put too much stock in a $600,000 bid for lucky.com when the stated reserve is over $1,000,000. There are plenty of domains names that don’t have reserves, too, but those don’t have bids anywhere near the above domain names. Big names added to live Moniker domain name auction. The list of domains for next month’s live auction during Webfest is growing. Bali.com has been added with a reserve range of $750,000 to $1,000,000. The site is owned by a Bali travel company. According to it’s about page, it has been operating as Bali.com since 2000. There are two 2 letter .com domains in the auction: xu.com and jf.com. The former has a reserve of $100,000-$250,000 and the latter has a reserve of $250,000 to $500,000. Message.com is listed for $250,000 to $500,000 as well. The same seller is also auctioning Judgment.com. Shane Cultra is auctioning off Successor.com, a domain he recently purchased. Tucows’ YummyNames has several domains in the auction: Jambalaya, Bez.com, and WebAdvertising.com. Pre-bidding is open with 8 domains receiving bids so far. Why sales were low and what it says about the current state of domain name auctions. Moniker’s live auctions (low & no reserve and premium) last week sold just over $400,000 of domain names. The top seller was Won.com at $115,000. All three of these would have sold for a few times more back in that fateful 2007 NYC auction. But alas, it’s now 2011. There were some good domains in this auction, but none of the biggies looked like deals. I didn’t see a single one that I thought would prompt a bidding war. During a breakfast with the media on Wednesday, Oversee.net CEO Jeff Kupietzky said that auctions are becoming more like marketing events. They get exposure for big names that then sell after the auction. For the auction house this is fine, but it’s a self-perpetuating cycle. 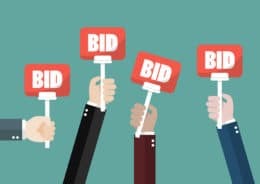 If you’re interested in a domain name it doesn’t make sense to bid for it at the auction unless someone else is also bidding. You’re better off waiting until after the auction to negotiate a better deal. Unless you have to have the domain name — in which case you should buy it ahead of time. The extended silent auction runs through February 17.